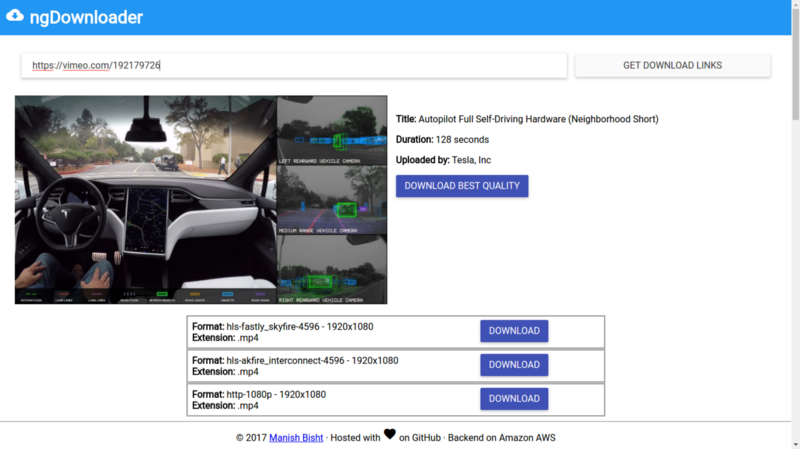 ngDownloader is a web application that gives the download links of the videos from various websites like youtube, facebook, udemy etc with no ads. I have made this application for AngularAttack 2017 Hackathon and selected as winner in Fun/Utility Category. Enter the URL-address of videos of the supported websites in the input field at the top of the page. Press Enter or click on the “Download” button to the right of the input field. The frontend was built using AngularJS 1 and Kendo UI. 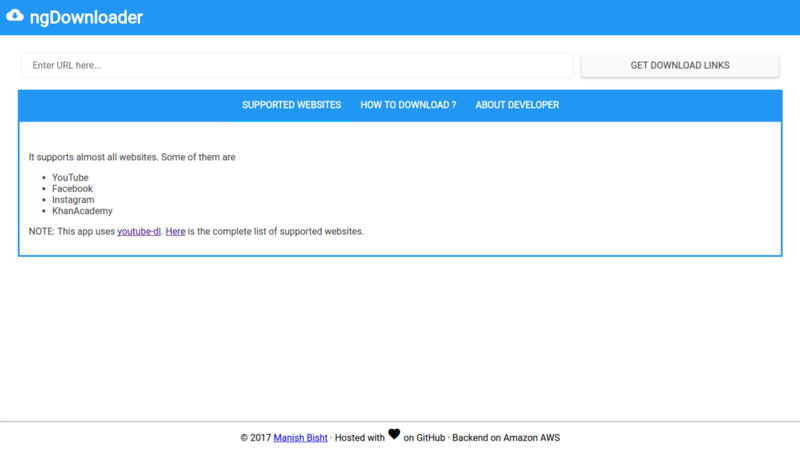 I have used Amazon AWS Lamda function and API gateway to host and run the backend. Here is the link of the backend code. Also it uses youtube-dl library to fetch download links. If you find any issue report it on https://github.com/manishbisht/ngDownloader or submit the PR fixing that bug; I would be happy to merge it. Bugs or feature request ? Drop email at [email protected] I would be happy to make it available for you. I will keep making more improvements and adding features in the future. I am using my Kendo UI Professional license so that I can improve the UI and use more components. There is the yearly renewal is charge for the domain per year and pay per use charge for Amazon AWS for backend. If you want to contribute a year or pay for hosting, send me an email and I’ll add the years on. Of course I’ll do my best to continue running the domain and hosting, but this is your chance to contribute to the community project. If anyone would like to get in touch with me I am not too hard to reach. Just drop an email at [email protected] I would be happy to have a chat with you. This was originally posted on my medium account. (C) Copyright 2017, Manish Bisht.